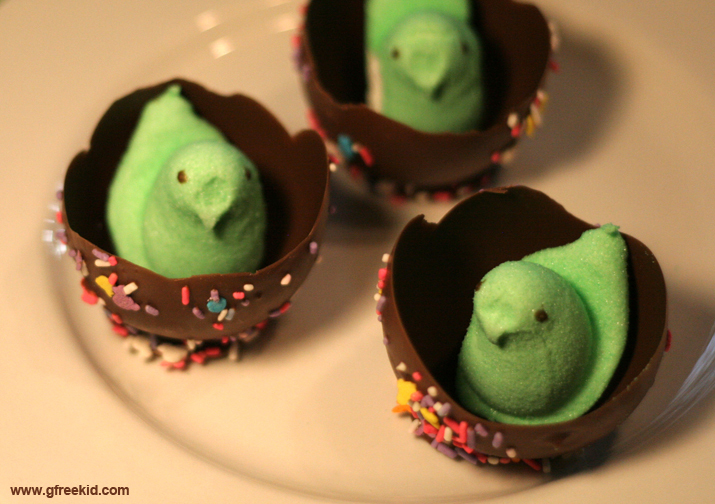 Easter Treat Ideas: Super Simple and Gluten Free! 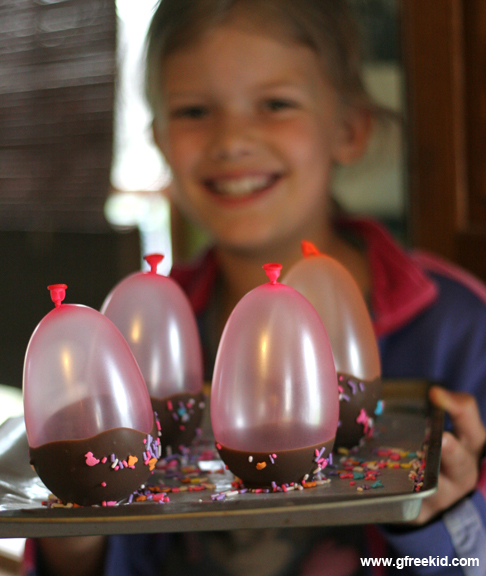 Then you can let your kids have fun popping the balloons! 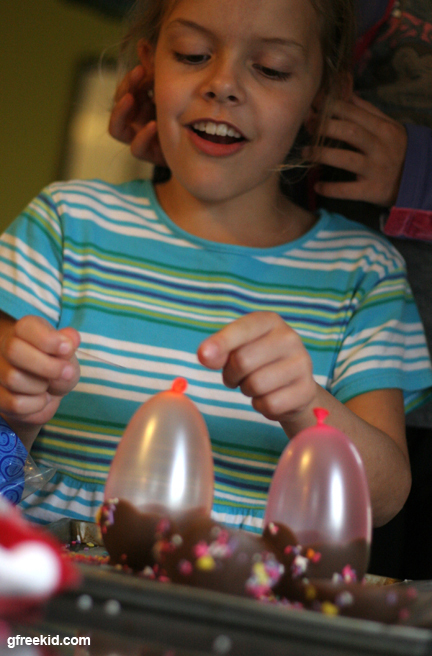 Below is Lindsey (with Morgan covering her ears) just before her needle popped the balloon… After it’s popped, you will find the shriveled up balloon in the bottom of the chocolate shell. 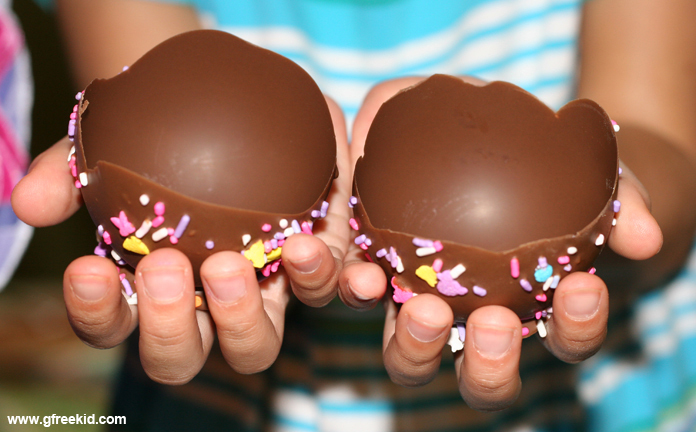 Carefully peel the balloon away from the chocolate and you’ll be left with shells like this: Then all you do is pop a Peeps chick inside for your finished product. Another idea is to make these into birds’ nests by adding coconut underneath the chick. The third idea is very simple as well. 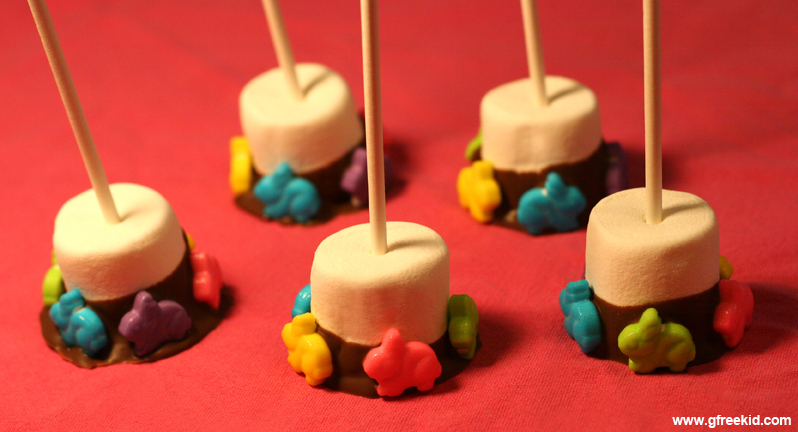 We call these “Bunny Trail Pops” and we just felt like doing something different than our usual sprinkled chocolate marshmallows. We popped a stick into each marshmallow, dipped the bottom of it in chocolate, set it on waxed paper and stuck bunny candies into it, evenly with one of each color. Again, set it in the freezer to harden. These don’t even need sticks, and you can experiment with any type of g-free Easter candies… After they have all hardened in the freezer, all of these treats can be kept in airtight containers in your fridge til they’re gone — which won’t be long! 🙂 Enjoy! 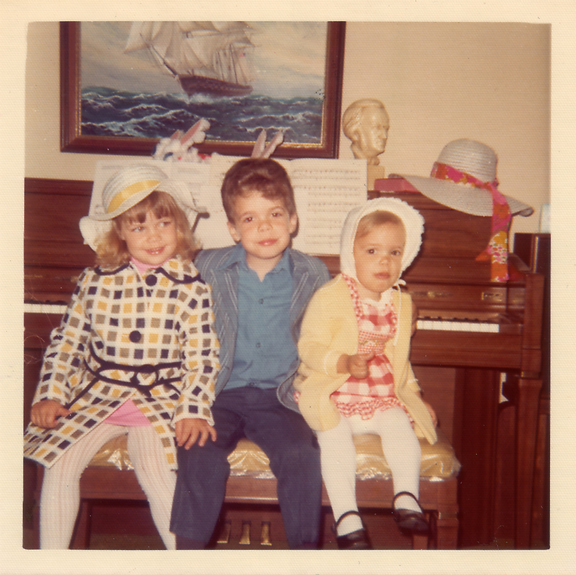 Psssst: Have you seen the photo album of g-free kids and g-free kids’ stuff page yet? For much more in between posts, follow me on Facebook and Twitter. This entry was posted in fun for kids, g-free recipes, kids in the kitchen and tagged celiac kid, chocolate, desserts, Easter, expiriment, fun ideas, g-free kid, gluten free, holiday, kids helping, marshmallows, Peeps, recipes, school parties by kachalmers2. Bookmark the permalink. I love these ideas! So cute! My kids would be thrilled! Are Sweet Tarts gluten free? Sweet Tarts ingredients are gluten-free, but their label states that they are made in a facility that also processes wheat. 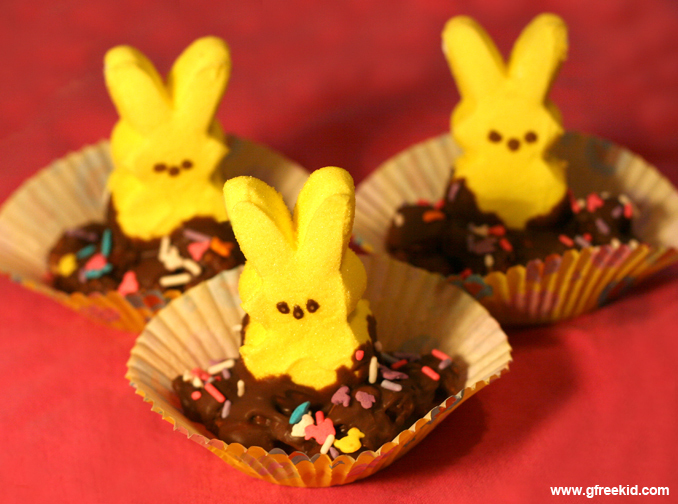 The bunny candies I used were from a bulk bin at Wegmans and the ingredients were gluten-free. They were Dylan’s brand, though, not Wonka, so I just included the link. But, again, use any kind of Easter candy: pastel m&m’s would look really cute circling the bottom of one of those marshmallows, as would any number of other Easter candies. Have fun! Forgot to mention -love the photo! What great ideas! I would love to be able to pin them to Pinterest! Thanks for sharing! These are very, very clever! Thank you for posting them. If you or a family member has an allergy to latex, please remember that your balloons are latex. One doesn’t normally check the chocolate to be sure it’s latex free, so if you make these for someone else, check for that life threatening allergy. 😦 The Easter Bunny never left me anything this cool when I was a kid!